A NUMBER of individuals who hold key information about the death of a priest 25 years ago say they are keen to hand it over to gardai. 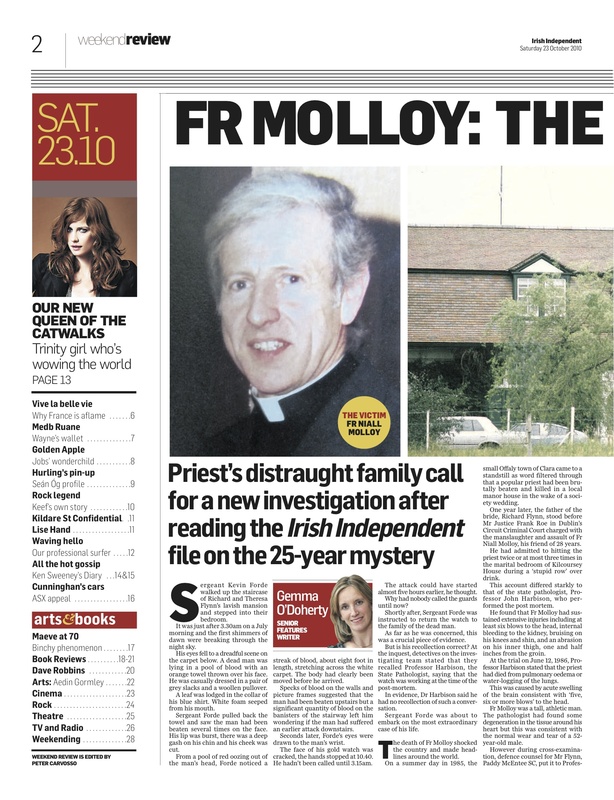 Several people who gave vital new evidence to the Irish Independent about the brutal killing of Fr Niall Molloy hope to hear from the gardai as a matter of priority. Fr Molloy (52) was found beaten to death at the home of his friends Richard and Teresa Flynn in the wake of a lavish society wedding in Offaly in 1985. Detective Superintendent Christy Mangan, head of the cold case unit, has been appointed by Garda Commissioner Fachtna Murphy to examine fresh details contained in a recent Irish Independent investigation. The Molloy family, who have fought for more than 20 years to have the case reopened, hope the new information will convince authorities to reopen the case. In recent days, there were calls in the Dail for an immediate review of the case on foot of the Irish Independent probe. Last week, Det Supt Mangan’s unit interviewed two individuals who came forward with new evidence relating to the killing. Details of the newspaper’s file have been given to the gardai. They include the names of individuals who hold information about Fr Molloy’s final hours, including a sighting of the priest in the immediate period before he was attacked. New details have also emerged about the condition of the body at the crime scene. The people who hold this crucial information say they were not interviewed by gardai at the time of the original investigation. Last week in the Dail, opposition justice spokesmen Alan Shatter of Fine Gael and Labour’s Pat Rabbitte called for a full re-examination of the case. But Justice Minister Dermot Ahern stated that this was a matter entirely for the gardai. This was disputed by Mr Rabbitte who said a Commission of Investigation into the case could be instigated by Mr Ahern. Both Fine Gael and Labour have pledged to carry out a full review of the case if they are in power after the next election. The Molloy family have written to Commissioner Murphy requesting the reopening of the case before his imminent retirement. “Niall was a wonderful, gentle human being who never hurt another soul,” said Bill Maher, Fr Molloy’s nephew, last night. Fine Gael and Labour last night pledged to order a full review into the killing of Fr Niall Molloy after reading a devastating Irish Independent file on the case. Alan Shatter and Pat Rabbitte, justice spokesmen for the opposition parties, said it would be a priority if they were in power after the next election. 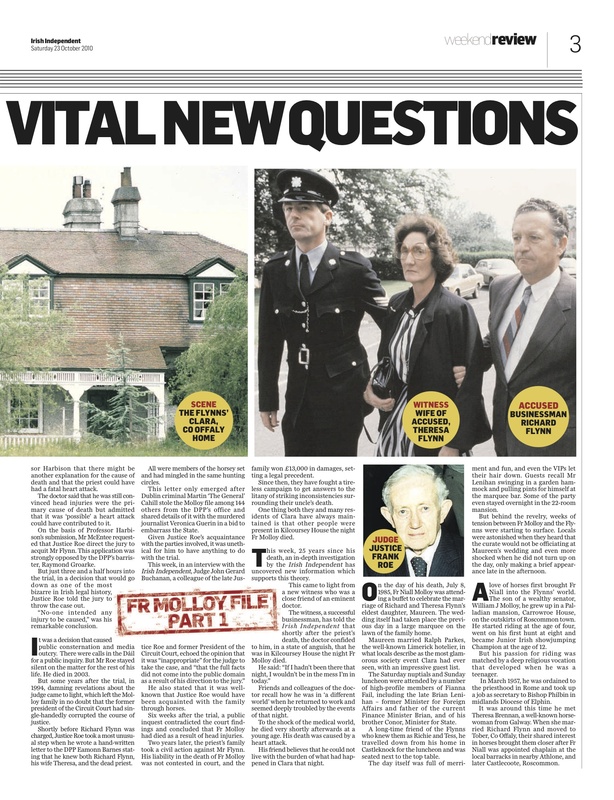 They made their promise after being shown details of this newspaper’s investigation into the brutal slaying of the Roscommon priest, who was beaten to death in the home of his friend Richard Flynn in Clara, Co Offaly, in 1985. The killing occurred in the wake of Mr Flynn’s daughter’s lavish wedding whose guests included the late Brian Lenihan, former Minister for Justice and father of ministers Brian and Conor Lenihan. The post-mortem on Fr Molloy’s body found that he had been violently beaten and died as a result of brain swelling resulting from multiple blows to the head. A year after the priest’s death, Mr Flynn stood trial for his manslaughter, but the judge, Mr Justice Frank Roe, acquitted him after less than four hours on the grounds that Fr Molloy may have died of a heart attack that occurred prior to the beating. It later emerged that Mr Roe knew Richard Flynn and should never had heard the trial. A subsequent inquest confirmed that the priest died as a result of head injuries. Last night, the family of Fr Molloy said they were overjoyed by the opposition pledge to reopen the case. 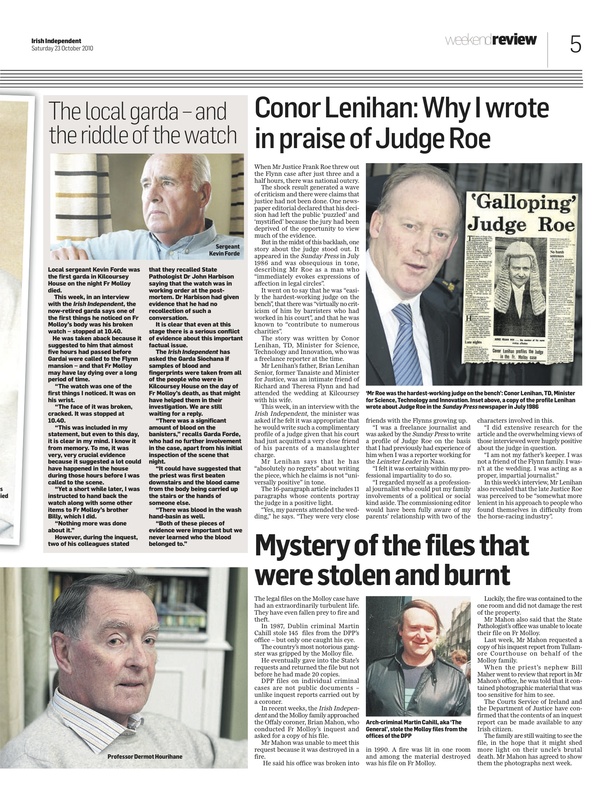 As pressure mounts on Justice Minister Dermot Ahern to order an immediate review of the killing, the Irish Independent has learned that the minister has requested a new report on the case from gardai on foot of our investigation. Today, he will face questions on the matter in the Dail from FG TD Alan Shatter. A damning statement by former circuit court Judge Gerard Buchanan about the late Mr Justice’s Roe decision to hear the Flynn trial. A witness testimony from the friend of a prominent surgeon. The surgeon told his friend that he was in the house where Fr Molloy was killed on the night of his death. 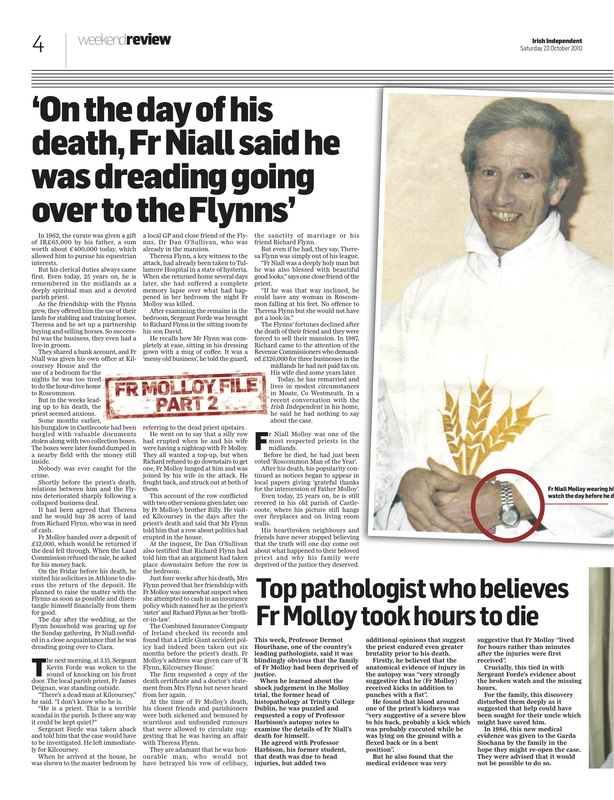 The surgeon died six months after Fr Molloy’s death. An interview with Sgt Kevin Ford, the first officer to inspect Fr Molloy’s body on the night of his death. He states that the watch on the priest’s wrist was cracked, its hands stopped at 10.40pm. Sgt Ford’s station was not contacted about Fr Molloy’s death until 3.15am.